We’ve come a long way as family coaxing little Valentina to eat fruits. She’s finally found a few fruits that she enjoys and will eat in its natural state. Other fruits she’s not enthusiastic about I include in family smoothies and hope for the best. I’ve also noticed when the kids get involved in making family meals and treats they are more likely to eat them. We were fortunate to receive the Chill Factor Pull Pots gift set to trial. 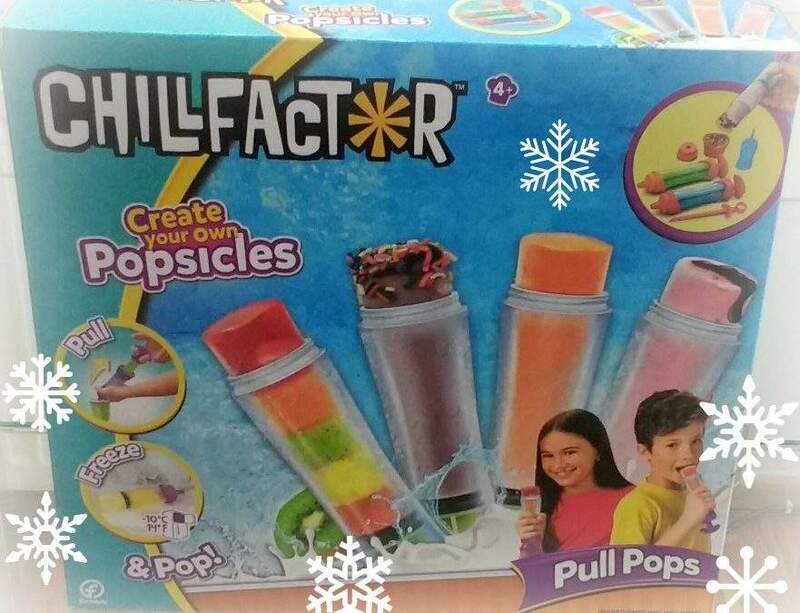 We had so much fun creating our bespoke popsicles and pull pops with Chill Factor. The individually packaged Pull Pop has only the one Pull Pop. To use them, you pull up the liquid with the Pull Pop, remove the handle, and then place in freezer in an upright position for 2-3 hours. The possibilities are endless with Pull Pops, whatever little ones fancy put it together. Then, they’ve got a snack or pudding in few hours. Use juice, fruit, yogurt, smoothies or a combination of those to make tantalizing treats. Personalised popsicles just might get a fussy eater out of his/her comfort zone, when it comes to fruit any way but it’s a start eh. I did two trials with the kids, then concocted a couple of my own for them. During our first trial (click link to see video) we were unable to get the liquids to stay in the Pull Pops. It could have been just the set we received. The suction was weak in our Pull Pop. On the second occasion the kids used fruits which was wonderful. Angelo and I used the injector to add some mango juice to the core of his fruity Popsicle. Both kids love mango juice, so made them mango popsicles once then on another I made a cranberry and blueberry cordial based Popsicle. Instead of using the suction for the Pull Pops, I removed the syringe-like cap, pulled back the handle, poured in the juice, and then replaced the cap. Before freezing I removed the detachable part of the handle. It may sound like an effort the way I did it but it wasn’t to me. Based on the quality of the product, the price point and the numerous flavour possibilities it’s more than worth it. Little ones who miss out of certain puddings and frozen treats can easily whip up tasty delights they can safely enjoy. Chill Factor Pull Pops are aimed at 4+ age group. I would still suggest that a grownup be at hand to help with the pulling or the pouring if needs be. Older kids and budding kiddie chefs should be able to manage on their own. Visit the Character website for information on Chill Factor Pull Pops. All parts can be separated easily for washing and drying before the next use. Individual Pull Pops RRP £4.99 and the gift set is £9.99. Side note… shhh between you and me… I’m thinking of trying grown-up treats for hubby and me with Pull Pops. The kids don’t have to know.